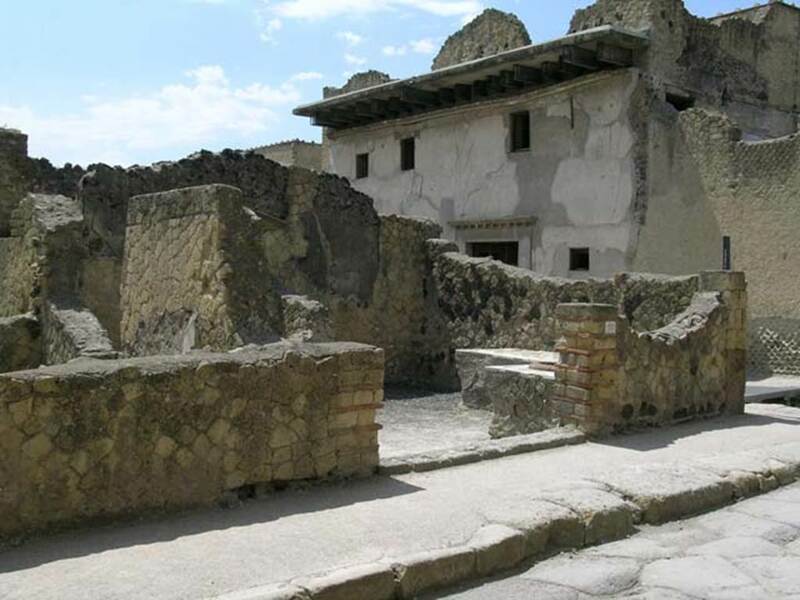 Herculaneum IV.10. Shop, linked to house at IV.11, photos linked together for 10 and 11. 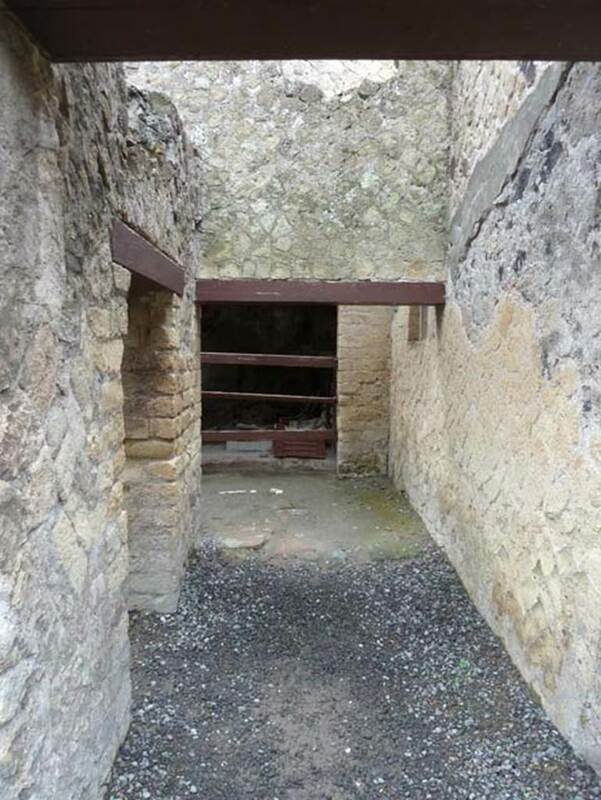 According to Wallace-Hadrill, this was a shop with linked dwelling at no. 11. In no.10, cereals were found in a dolia in the shop, there was also a rear room linked to no.11. Pesando and Guidobaldi wrote that the large quantity of carbonized grain found in the shop suggested that a seller of cereals worked here. 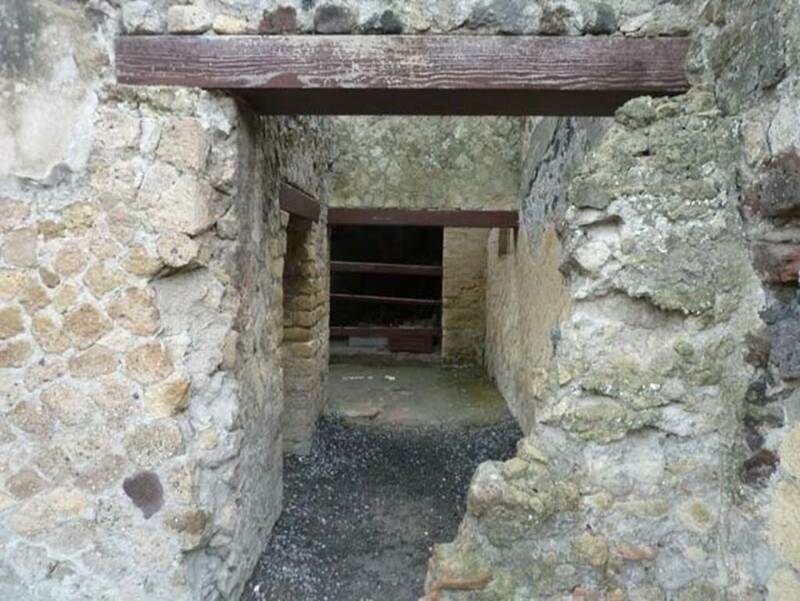 Camardo and Notomista wrote that an iron case containing 2 kg of grain was found here, unfortunately, no image exists. 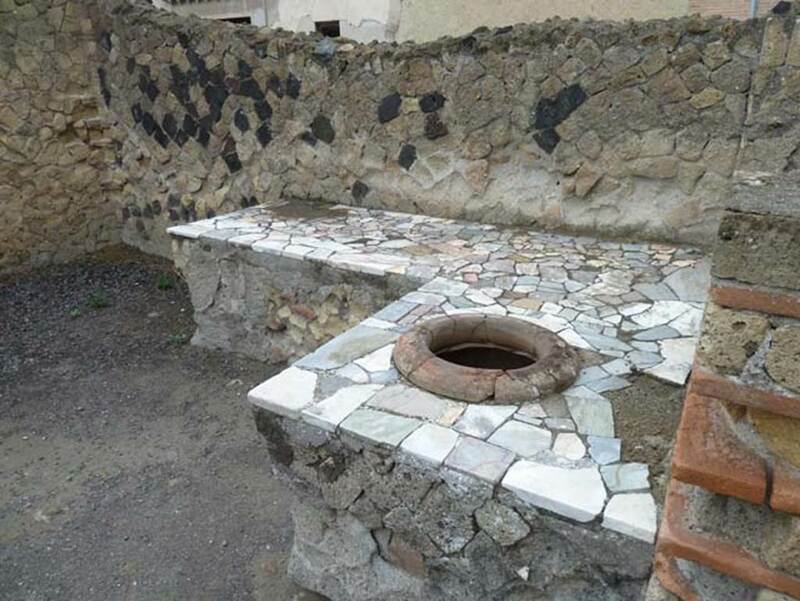 Decumanus Inferiore, Herculaneum, September 2015. Looking east from junction with Cardo IV. On the left is V.1, and on the right is IV.10. 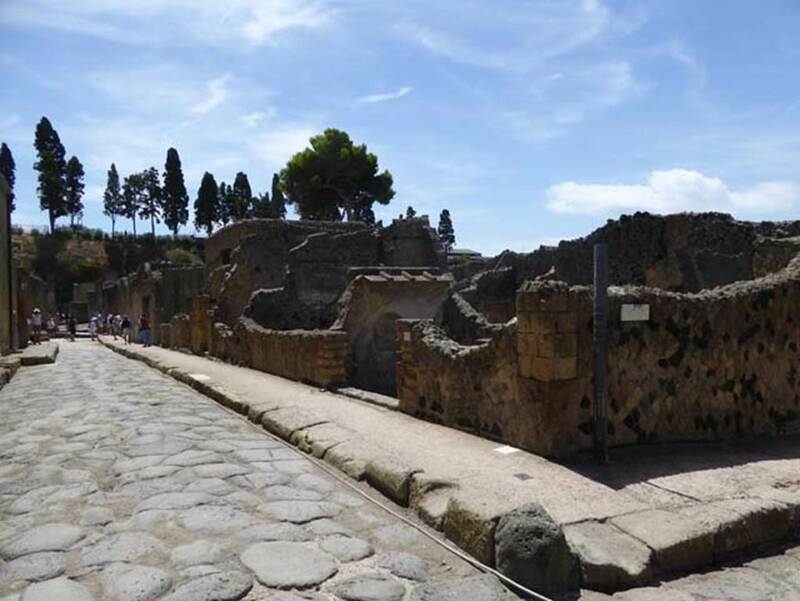 Pesando and Guidobaldi wrote that all of the north side of the insula facing the Decumanus Inferiore was occupied by commercial outlets with adjoining dwellings. 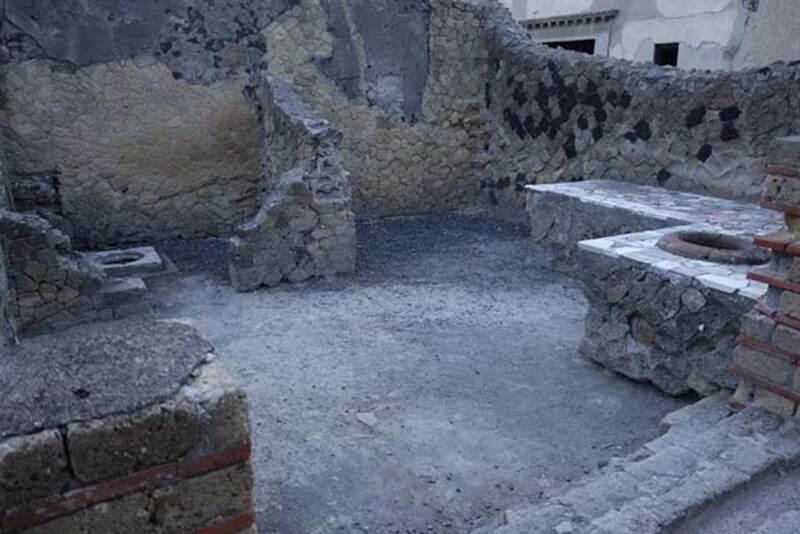 Decumanus Inferiore, Herculaneum, July 2015. Looking east from junction with Cardo IV, with IV.10 on the right. 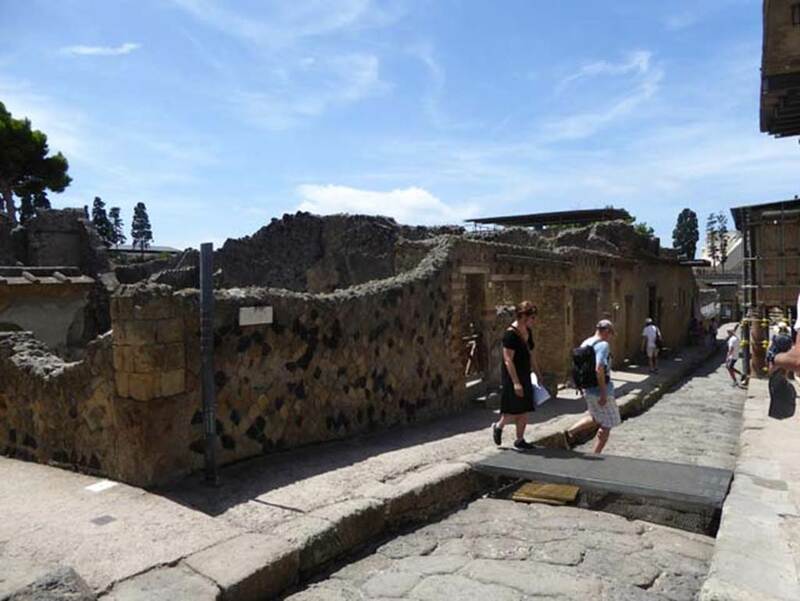 IV.10, Herculaneum, September 2015. Entrance doorway on Decumanus Inferiore, looking eastwards. 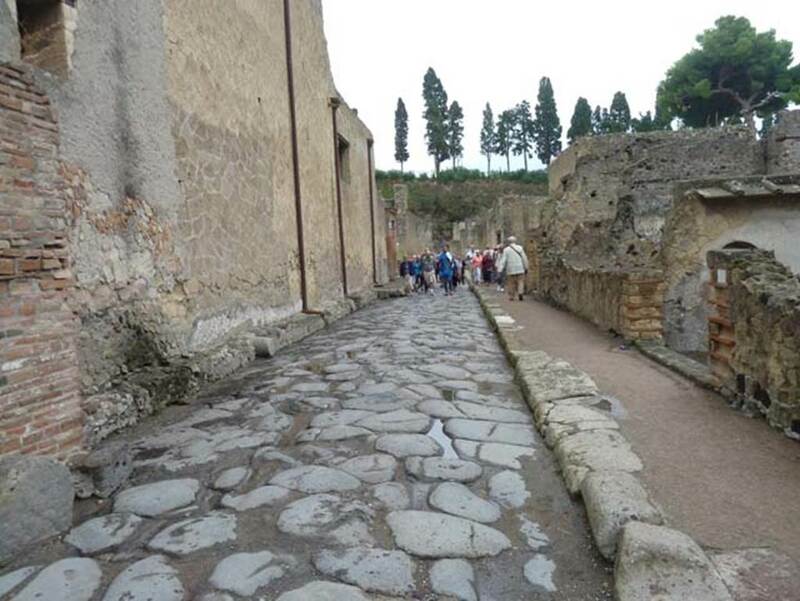 IV.10, on left, Herculaneum, July 2015. 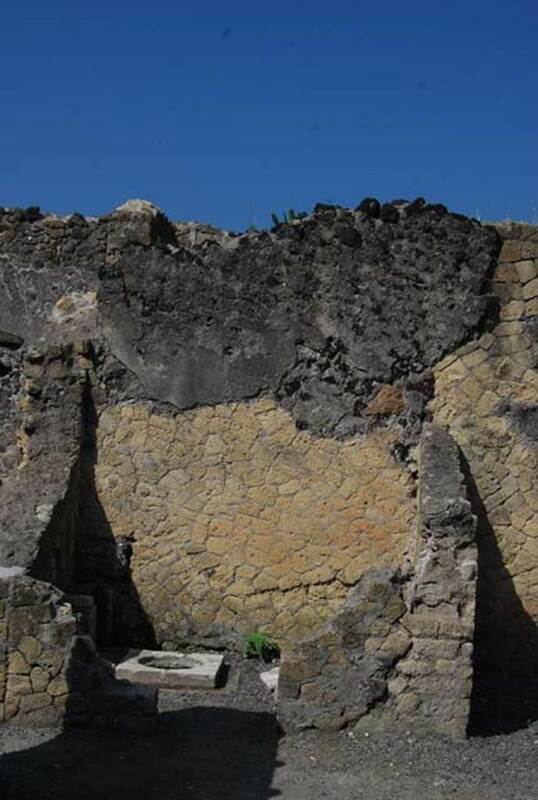 Exterior walls of shop, on east side of Cardo IV, looking south. 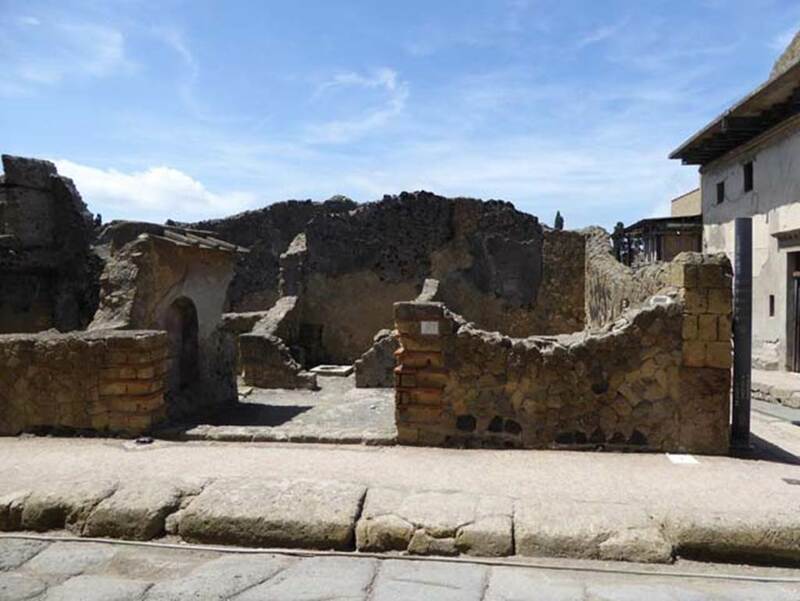 IV.10, Herculaneum, July 2015. 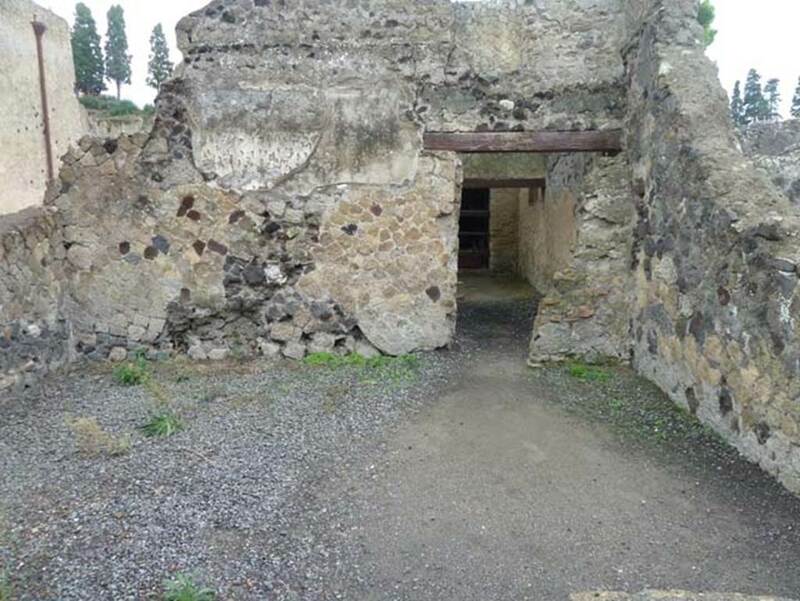 Looking towards entrance doorway, on south side of Decumanus Inferiore. 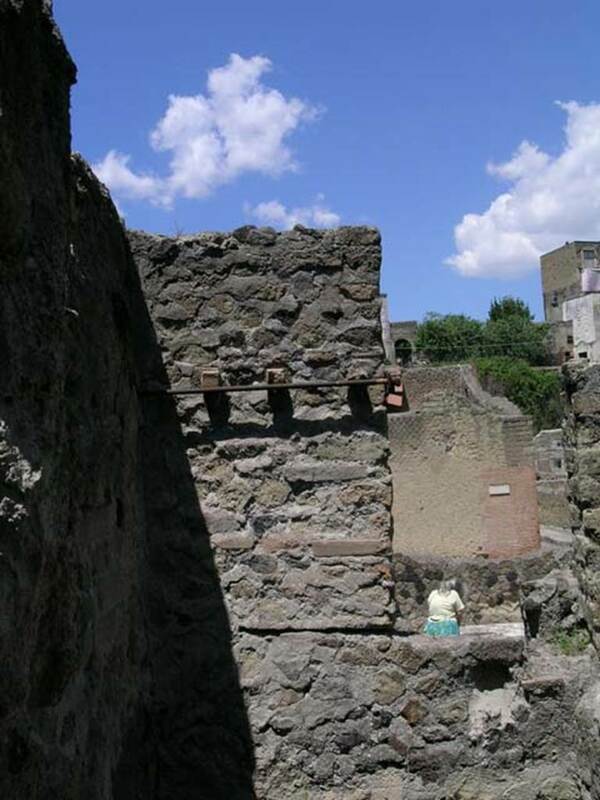 IV.10, Herculaneum, May 2003. Looking south towards wall on west side of entrance doorway. 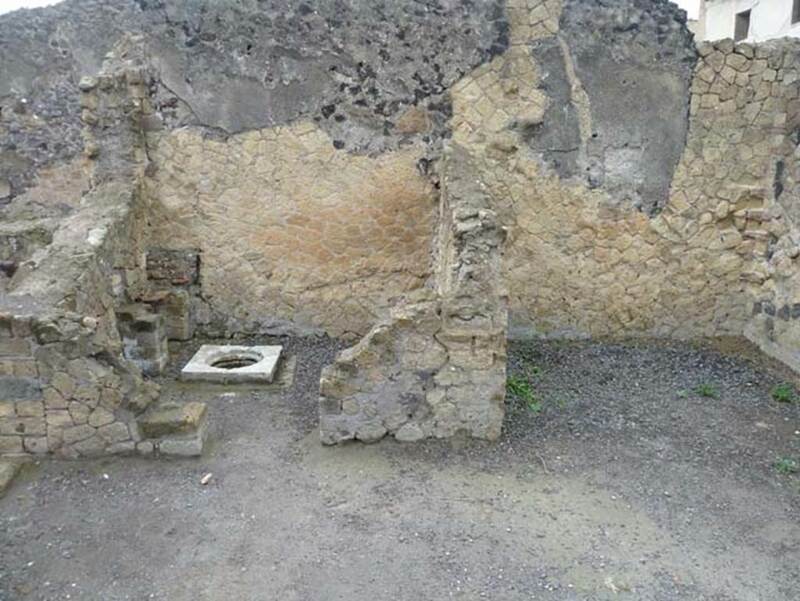 IV.10, Herculaneum, October 2014. 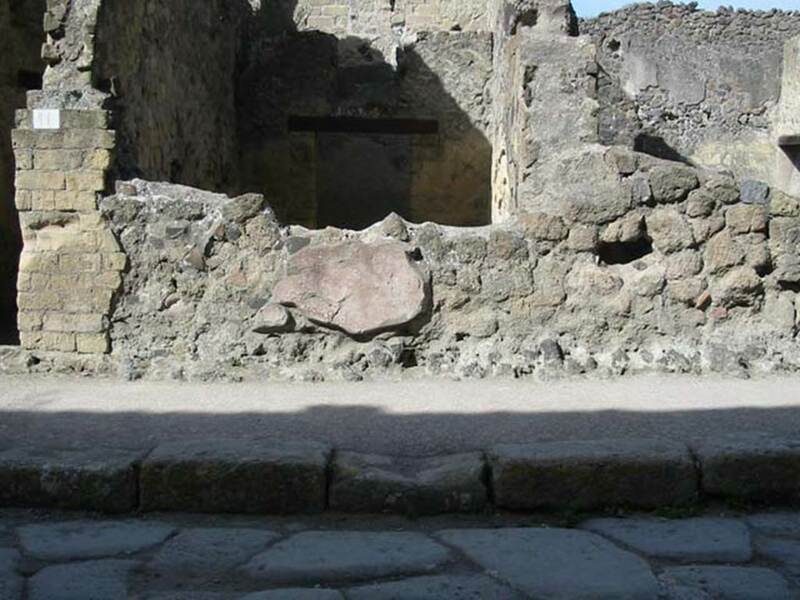 Entrance doorway on south side of Decumanus Inferiore, looking south-west across shop. 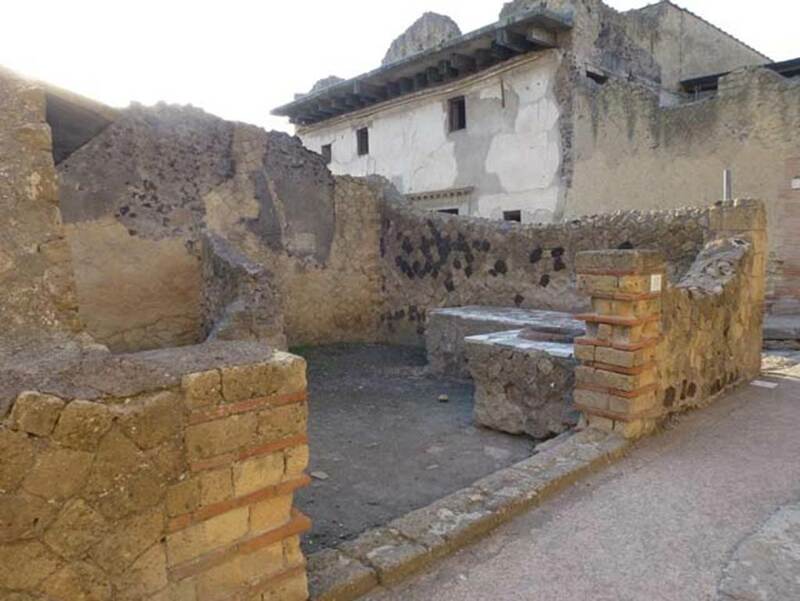 IV.10, Herculaneum, October 2012. Entrance doorway on south side of Decumanus Inferiore, looking westwards. 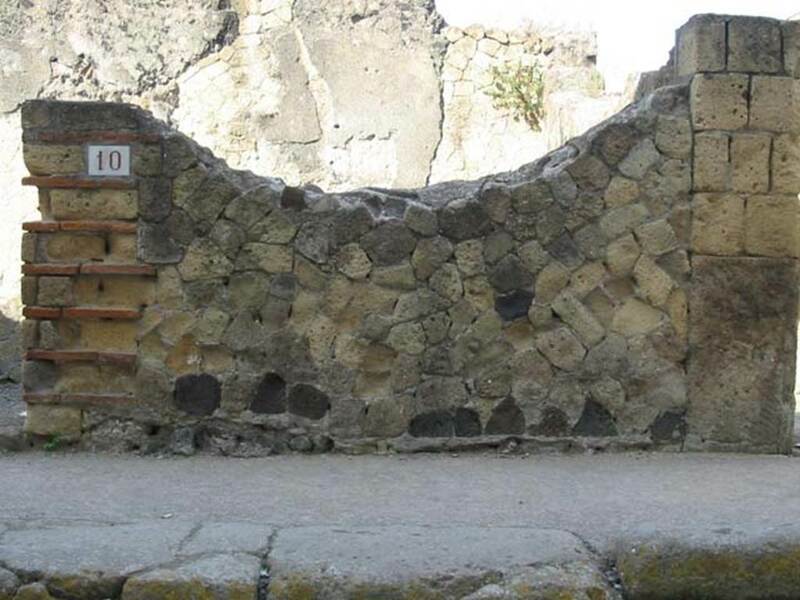 IV.10, Herculaneum, May 2006. Entrance doorway on south side of Decumanus Inferiore, general view looking westwards. 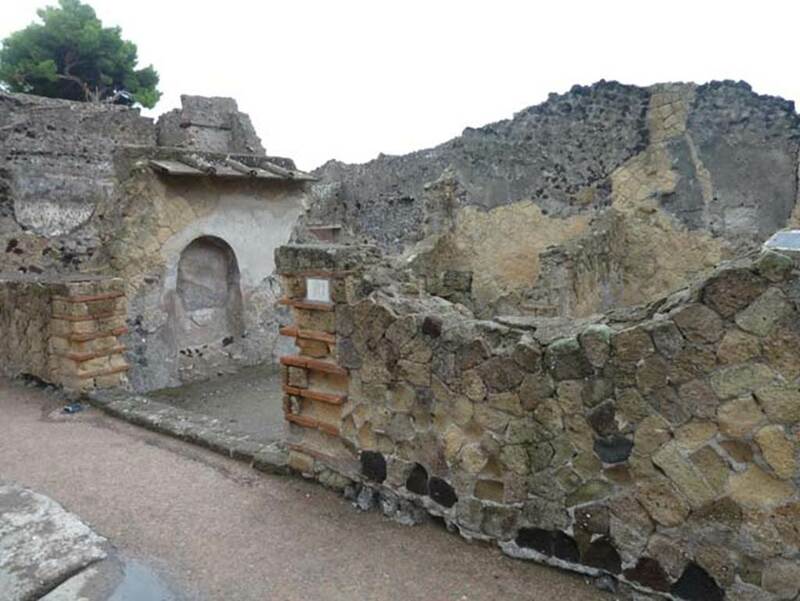 IV.10, Herculaneum, September 2015. Niche in east wall of shop-room. Looking south-west from entrance towards two-sided counter/podium, with one dolium set in counter. 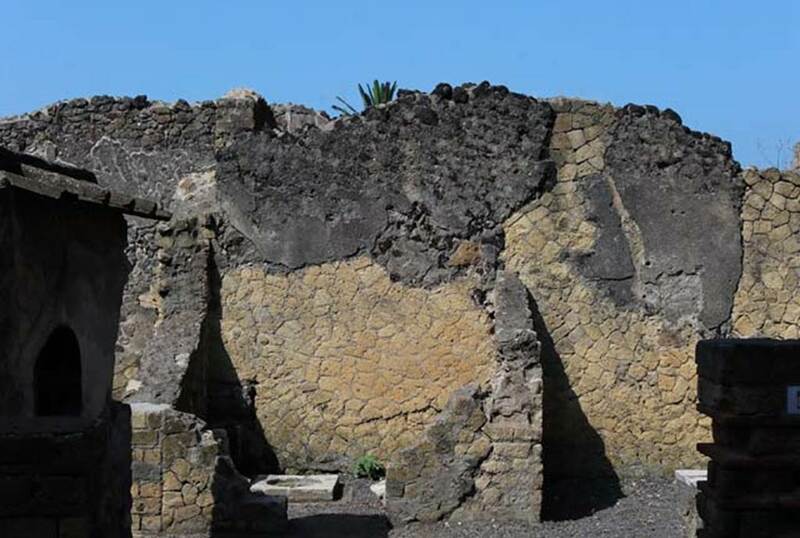 IV.10, Herculaneum, September 2015. Rooms on south side of shop-room. 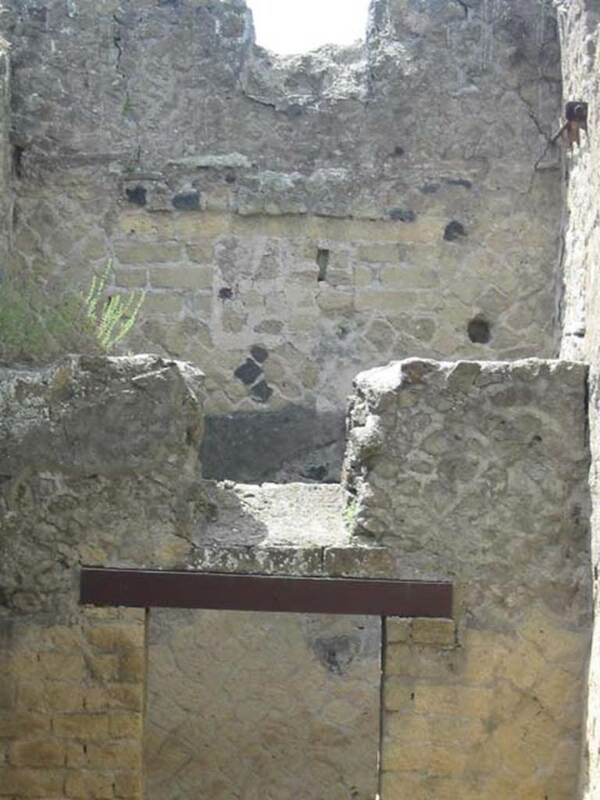 IV.10, Herculaneum, June 2008. Looking towards south side of shop-room. Photo courtesy of Nicolas Monteix. 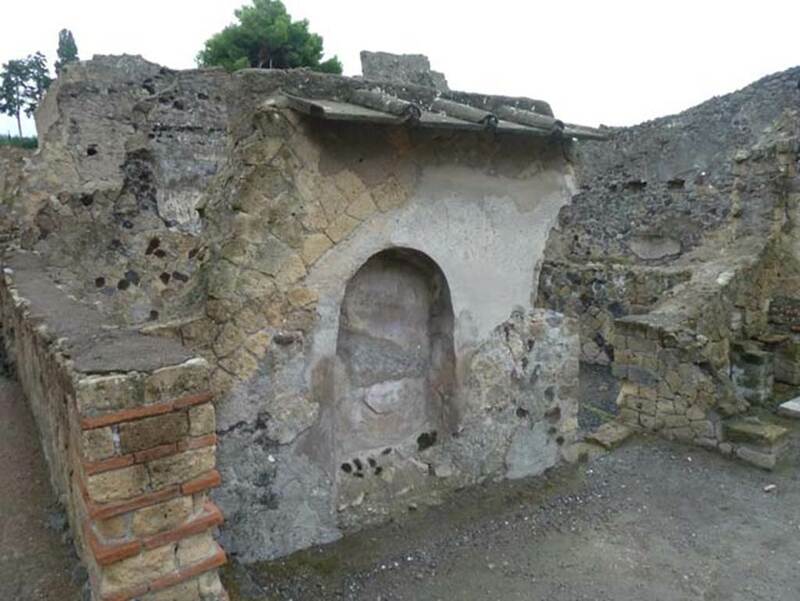 IV.10, Herculaneum, September 2015. Doorway threshold between shop-room and large room on its east side. 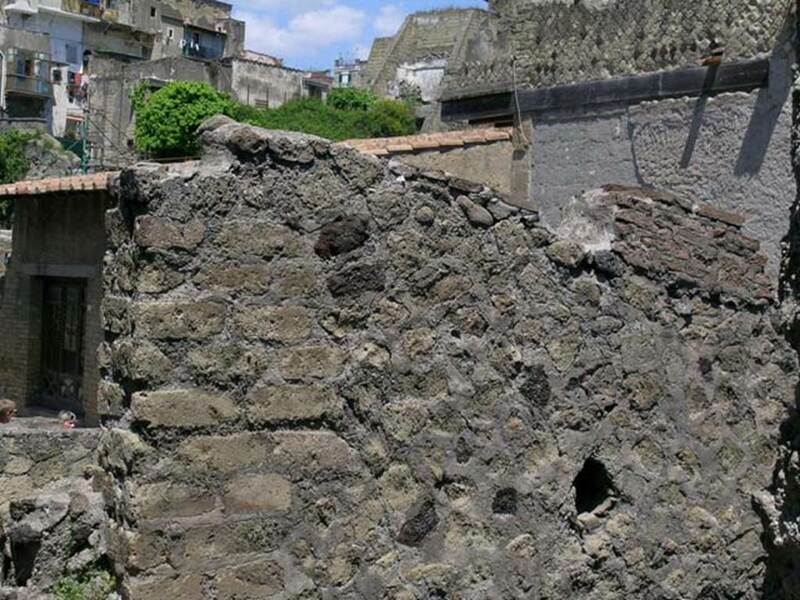 IV.10, Herculaneum, June 2006. Large room looking towards north wall. Photo courtesy of Nicolas Monteix. 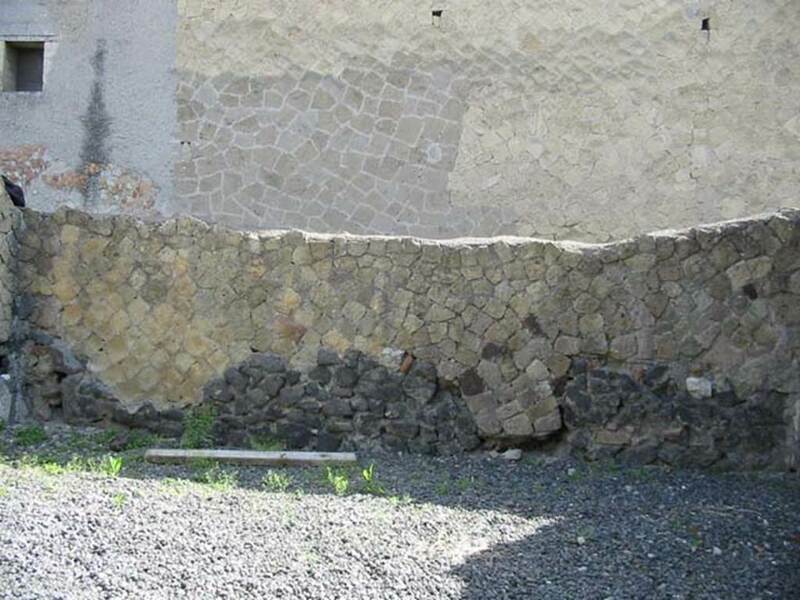 IV.10, Herculaneum, May 2003. Detail of north wall in large room on east side of shop-room. Looking east across large room on east side of shop-room, probably part of IV.11. Looking east towards remains of wall, in south-east corner of large room, probably part of IV.11. 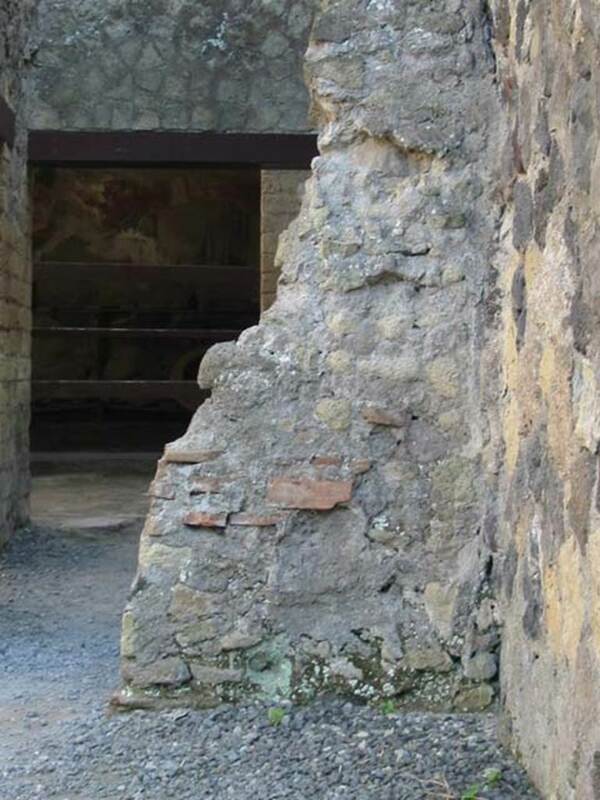 Small corridor in south-east corner of large room, probably part of IV.11. 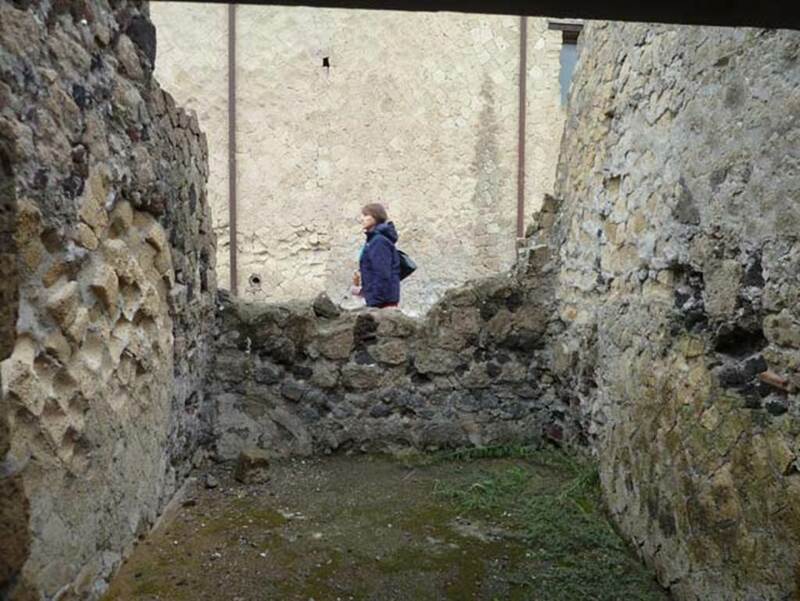 Looking east along small corridor, towards an area that would have been reached from the doorway at IV.11. Doorway to room, a cubiculum, on north side of small corridor, probably part of IV.11. Looking north in cubiculum on north side of small corridor, probably part of IV.11. 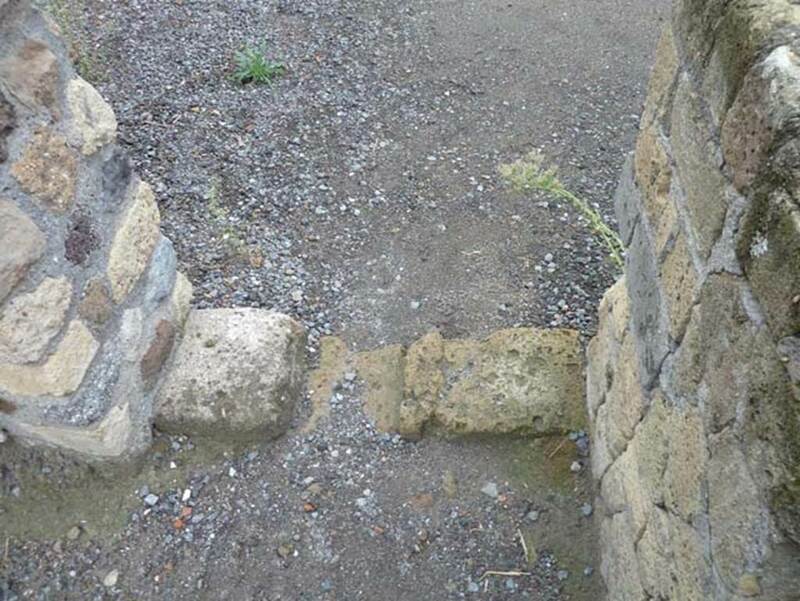 Looking towards exterior wall of small cubiculum, on south side of Decumanus Inferiore, on west side of entrance doorway, on left. 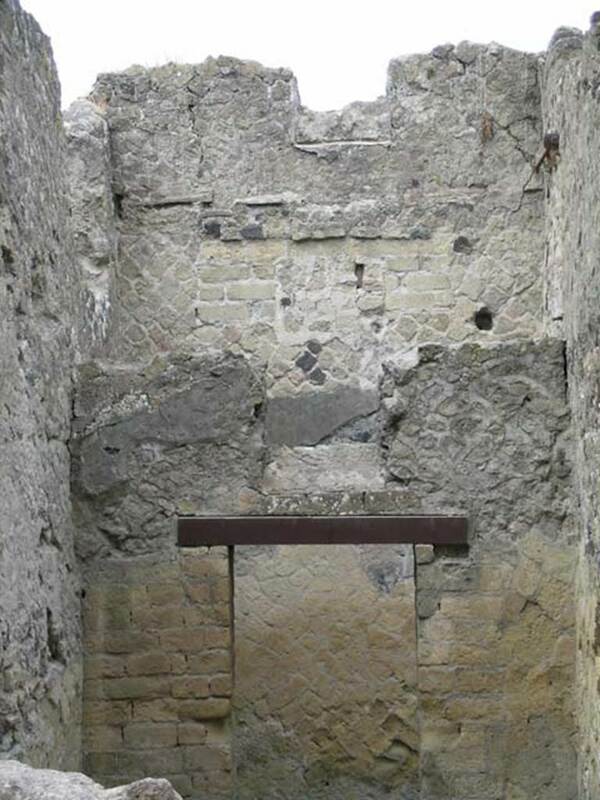 Looking towards south wall of small cubiculum with doorway to a corridor and small window above it. In the rear wall of the corridor another window can be seen, which would have taken light from the small courtyard/lightwell of IV.8. 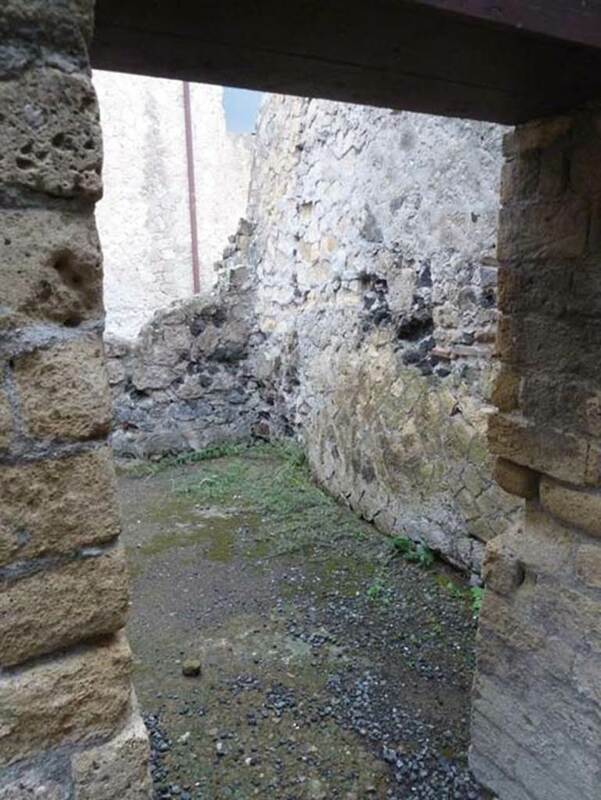 Looking towards upper west wall with doorway/window in south-west corner of corridor behind small cubiculum. 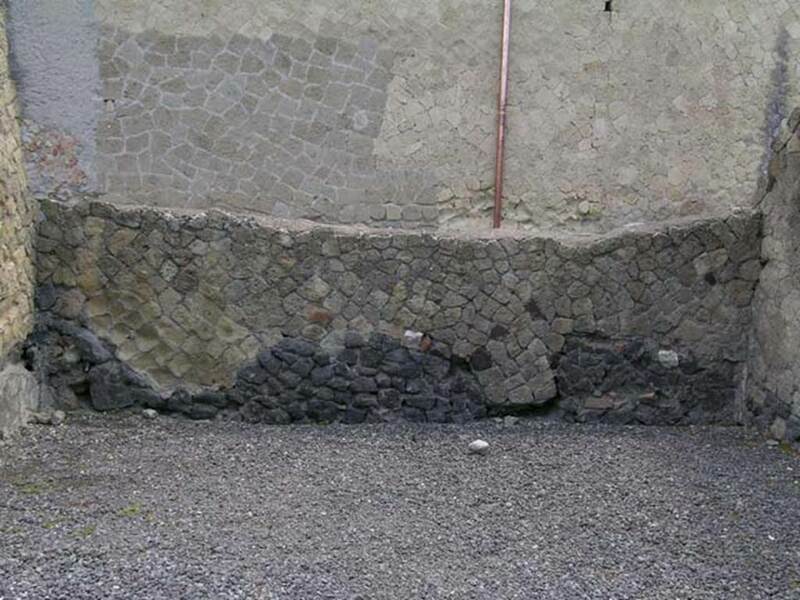 IV.10/11, Herculaneum, May 2005. Looking towards upper west wall on north side of doorway/window.